The rare white truffle: the hunt is on! Home/Leisure/The rare white truffle: the hunt is on! Put on your boots and join us in Piedmont, Italy — Monaco’s next­door neighbour. To call it a mushroom is blasphemy – it is at the apex of fine cuisine, “the diamond of the kitchen” according to French gourmet Jean Anthelme Brillat-Savarin. Imagine! – the rarest of culinary gems, with a divine aroma that cannot be cultivated, that gets sparser by the year. It is the white truffle, “the King of Haute Cuisine”, found hiding impishly within the living roots of chestnut, oak, hazel, and beech trees. Praised by the ancient Pharoahs of Egypt and by the Greeks, legends and myths about truffles abound, including the good fortune of a farmer who spotted his prize piglet snorting delightedly at the root of an oak tree, munching “tubers” mingling in its roots. Noticing that his prized piglet grew healthy and fat, the farmer tried the mushroom-like delicacy himself. And year after year thereafter, the wife of this childless couple bore beautiful children – thirteen in all! And the reputation of the therapeutic properties of truffles as God’s gift to humanity spread far and wide. White truffles from Piedmont, Italy. It is difficult to find a chef who is not in love with this divine, pale white delicacy. 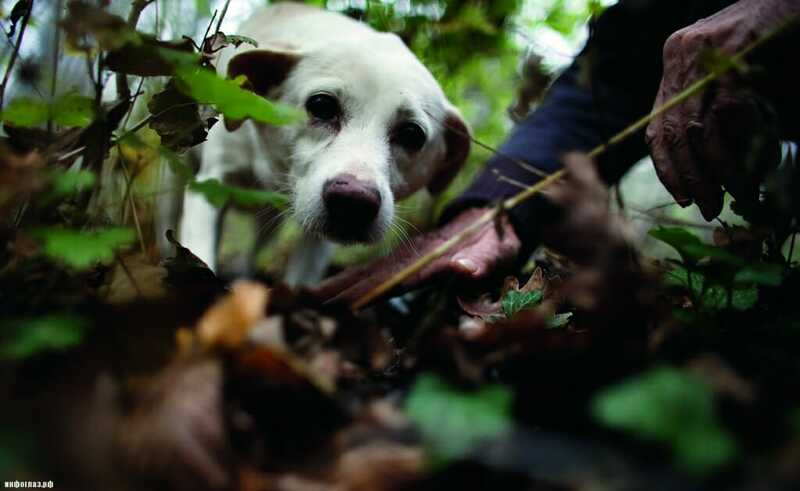 Luigi is a Piemontese trifulau (veteran truffle hunter) in the Mombercelli woods near Asti. 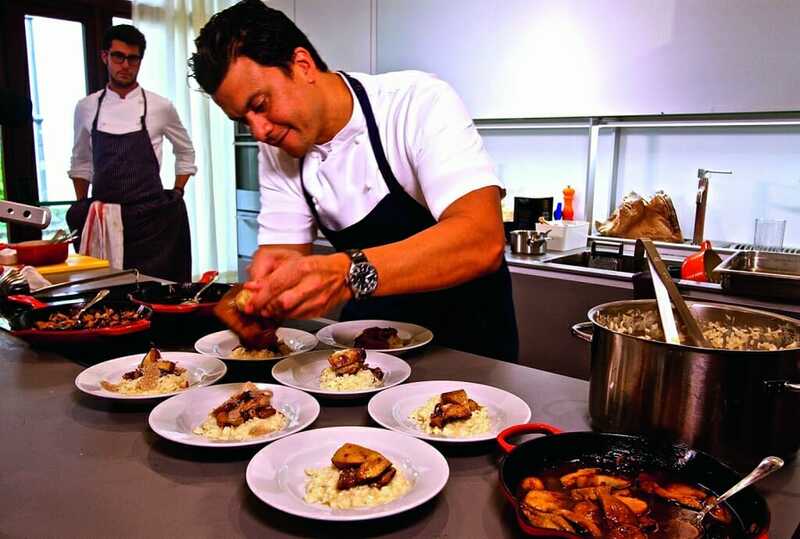 His wife Larissa prepares scrumptious dishes to showcase the flavour of the truffles. She sprinkles a few marble-like truffle shavings over her many creations: scrambled and fried eggs; “tajarin”, the prized local pasta; steaming hot risotto; and a raw veal dish called “carne cruda” (Piemonte’s answer to steak tartare). It’s all about rewarding one’s aromatic senses while creating visual displays worthy of Leonardo da Vinci or Michelangelo. To take advantage of the delicate nature of the truffle and its unique aroma, Larissa’s dishes are moist, and often based on melted cheese, cream or butter. «It is important that they are steaming, because heat is a catalyst in bringing out the aroma», she explains. “White truffles are nearly always best twinned with simple food”, says Larissa. This is innate in the magic of Italian cooking. Simple and traditional Piemontese or Tuscan dishes, make truffles stand out – not elaborate dishes. Nothing should take away from the inspired aroma of the truffle. It may be no coincidence that the same soil that nurtures the oak roots that bear truffles, also bears the fruit for some of the best wines in the world. They are twins borne of the same soil, and the relationship between local wine and truffles is ancient. So if you find yourself hunting for truffles in northern Piemonte, near Alba and Asti, take advantage of the region’s famous and elegantly structured reds, Barolo, Barbaresco or a simpler but equally delicious Barbera or Dolcetto d‘Alba. If you move east, to Italy’s other wine jewel of Tuscany, wine connoisseurs would advise you to pamper your palette and gently wash down the truffles with the local but world-famous reds, Brunello di Montalcino or Nobile di Montepulciano. And in this case, one cannot say no to savouring the wine along with the prince of steaks, the Tuscan Chianina, topped with shavings of white truffle. Aromatic white wines also go down well with truffles, why not try pairing white truffle with a Chardonnay from the Langhe area or a Timorasso white from Piemonte. Fortunato Nicotra, executive chef at New York’s Felidia, came by “great truffles” at around $1,300 a pound in 2016, he told Bloomberg. This year, he is paying $2,800 to $3,200 a pound for golf ball­sized tubers. Larger sizes are rarer, and anything weightier than 40 grams can cost several hundred dollars more per pound. On a crisp Piemonte morning, Luigi leads us up muddy slopes, through green grass and vibrant autumn leaves as Amadeo, his prized dog, darts forward, sniffing at the ground. His tail wagging furiously as he catches the scent. The little tuber cannot be seen, hidden several centimetres below, close to the roots of a gnarled oak tree. But Amadeo is drawn to it like a bee to pollen and he begins jabbing at the ground with his front paws. Luigi and Amadeo exchange a knowing glance before he starts digging. We all hold our breath as earth sprays skywards and Amadeo zones in on the prized nugget. And yes – he strikes gold. «The truffle is a sensory emotion. It’s an aromatic dream more than just a taste», says Luigi. His family has scoured these woods for generations. «It’s an emotional moment when you find it. It’s ecstasy later when you eat it». 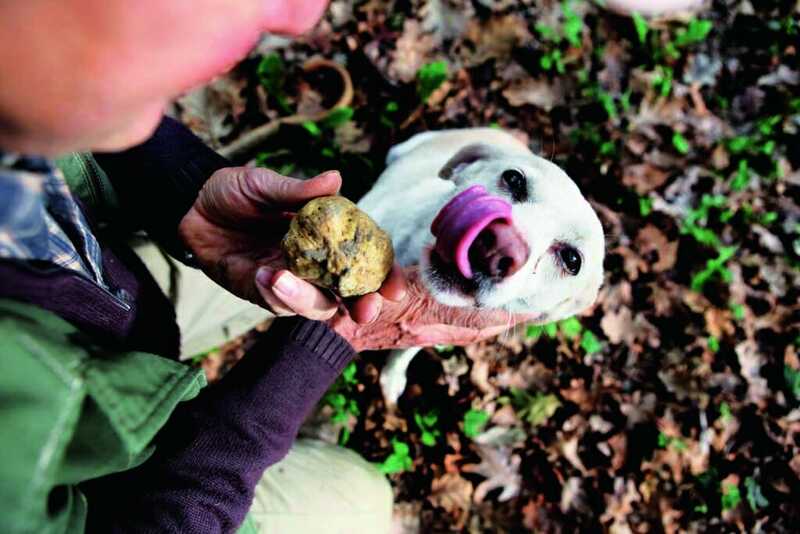 Luigi is carried away almost in a trance «My memory of finding my first truffle is still vivid like I remember my first love, my first caress, my first embrace. Like that potent first kiss, it’s impossible to emulate». His wife Larissa’s eyebrows are raised and a dangerous glint in her eyes brings Luigi’s reminiscing to a stuttering halt! Luigi dashes over and from his pocket emerge tantalizing gorgonzola treats for Amadeo to draw his attention away from his find. This unearthed pearl, this beauty at 40 grams may be worth 250 euros. Easily distracted by the treasure, Amadeo greedily gulps down his cheesy rewards. Kneeling down and carefully brushing away the soil with all the intensity of an archaeologist unearthing the mask of Tutankhamen at the Pyramids, Luigi works around the truffle with a special mini-spade or vanghetto. At first sight the find resembles a knobbly, small earth-covered potato. But lying inside is a marbled interior, tan with creamy, ivory veins, and the scent is intoxicating. The firm texture and pungent aroma all point to its freshness and ripeness. 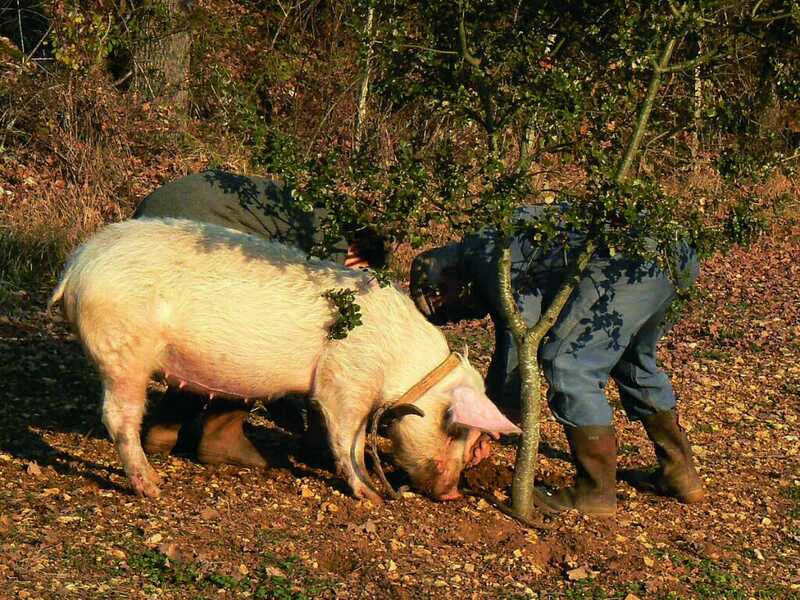 Traditionally, pigs were used to hunt truffles because they have the sensitive snouts required for the job. But their use is now banned in Italy as they damage the root systems where the truffles nestle. And we are not talking about sweet Miss Piggy from the Muppets. Never get between a 250-kilogram pig and a truffle it’s focused on eating! Amadeo is a mix of Springer spaniel, Segugio Italiano and setter. Like his owners, Amadeo is from a long line of truffle hunters. His is a hardy mongrel mix that ensures vitality, stamina and a keen sense of smell. While Luigi and Amadeo walk ahead, Luigi whispers to him in Piemontese an ancient regional dialect still alive among the trifulau. “It’s important to know your dog, have empathy with it just like with a mistress”, explains Luigi, as the dangerous glint in Larissa’s eyes becomes a frown on her forehead. “I learn something special from my dog on every hunt”, says Luigi. “Every day you have a new experience”. Six weeks of heaven are just a hop, skip and a jump away in the delightful picturesque town of Alba. 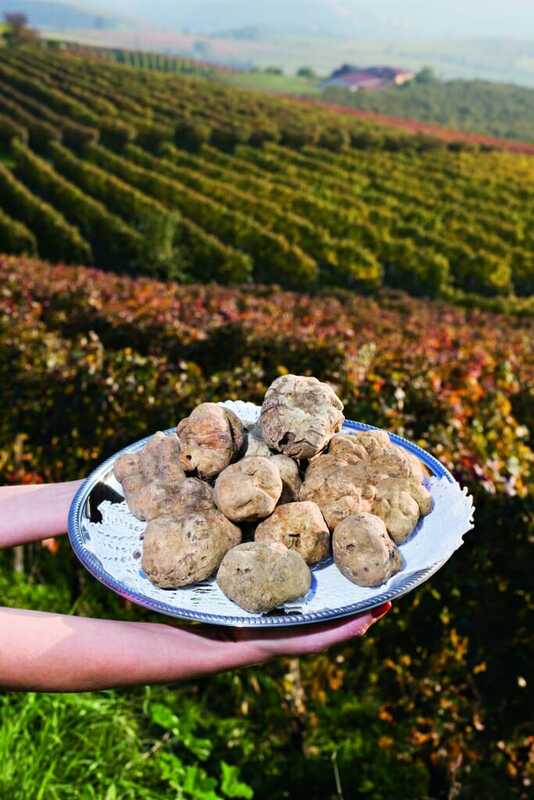 In Piemonte, the truffle season is now in full swing and its centrepiece is The International White Truffle Fair, held from 7 October to 26 November. Descending on this wine and truffle lover’s paradise are a few other delicacies whose season revolves around this internationally recognised event. Did we say just a few?! Let’s say hordes. 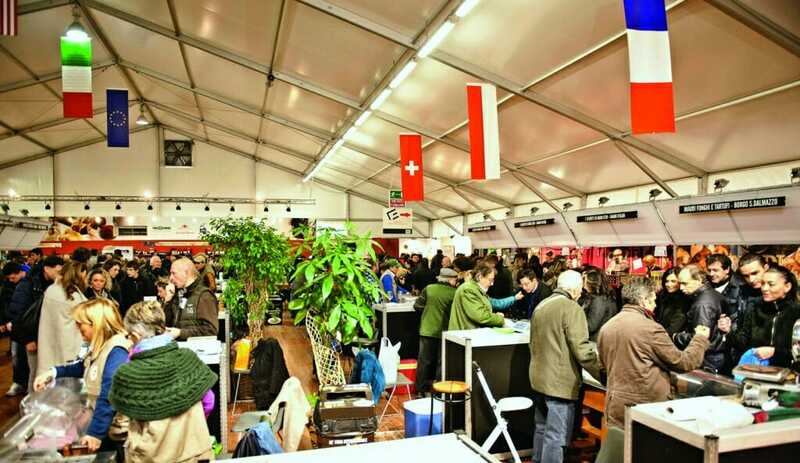 It is an absolute hive of activity – a veritable pandemonium – drawing crowds from Monaco, France, Italy and all around the globe. The Fair is a blazing attack on the senses, with a kaleidoscope of shapes and colours, aromatic delights, and heaven for the taste-buds. Myriads of white truffle stalls await you. The «perfume» is intoxicating. Just imagine hundreds of white truffles all under one dome. It will be for certain the most intense white truffle aroma you will ever experience. Meander among a potpourri of additional delicacies such as Barolo wine, grappa, cheese from Bra, tajarin pasta, salamis, desserts, exquisite chocolate creations, mushrooms of every variety and, not to be missed, the famous hazelnuts which make up the Ferrero chocolate empire. And there is still more… chestnuts for roasting from Cuneo. Savour a range of food delicacies in the restaurant arena – tempt yourself with shaved white truffles over scrambled eggs, carne cruda (veal tartare), or a simple tajarin pasta with butter. By 8pm the Fair is winding down and as evening descends there is another fabulous dining experience – perhaps at Piazza duomo in the centre of Alba. Owner Bruno Ceretto says: «the dishes should be beautiful, accentuated by their perfume; the palate is just a confirmation. When the dish is finished, it should always leave you with the desire to eat a little more. Only with yearning can there be real pleasure: there is always a small gap that cannot be filled, as in love». If your idea of a good truffle hunt is searching for the telephone number to book a table at a Michelin star restaurant in Monte Carlo, why not? One day, waxing enthusiastically to a friend about the prospect of hiking through the woods with the trifulau and his dog, then back to the «farmhouse» shirtsleeves up helping prepare the feast to come, my friend said: «why would I bother to do all that when I can jump in the Rolls and dine at Louis Quinze?» She does have a point. In Monaco we are spoiled for choice – all we have to do is triangulate between Chez Bruno in Lourges, Truffle Gourmet in Place d’Armes and Louis Quinze — never mind Polpettos and more than a handful of other fine dining establishments. Sea urchin pasta with sliced white truffle / and white truffle ice cream for dessert. As for me, I will head for the woods and admire Amadeo as he wags his tail furiously unearthing another white diamond for his beloved master, Luigi. This simple authenticity warms my soul. So instead of three Michelin stars, I will choose a heavenly feast made by Larissa, warming myself by a roaring fire, feasting on six courses each topped with shaved truffle, good company and a glass (or two or three!) of Barolo. It will then all be followed by a glass of Grappa or Limoncello. What is your style of hunt, I wonder?